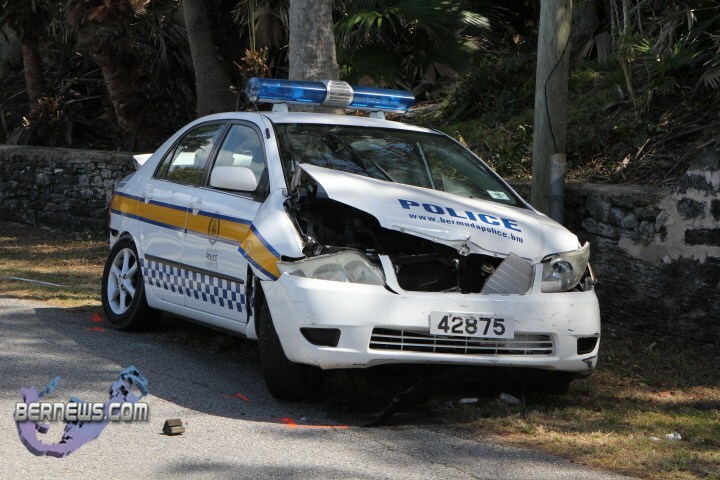 [Updated] At approximately 1pm today [Mar.28] there was an accident involving a police car on North Shore Road. An section between Barker’s Hill Round-a-bout and Dock Hill was blocked off while police investigated the crash. A tow truck removed the car at approximately 2.45pm, and the road remains blocked as of 2.50pm. Details are sketchy but it is understood the driver was not seriously injured. We will update with official information as able. Should not have been eating those donuts while driving. Glad all officers are ok though. How come I see more accidents involving police cars than actual motorist!?!?!? Who is giving these guys licenses? They need to go to some special training driving lessons to chase down these scumb bag thugs these days! What a stupid @$$ comment. All the damn accidents that Bermudians are in every day. All you have to do is drive by Bermuda Motors on a Monday morning to see the amount of cars destroyed by the terrible drivers in this island. Its just that a police car is news gives something for YOU to comment on. lol if you read the articles about weekend accidents you’ll change that thought..
You people have no consideration for the person involved. 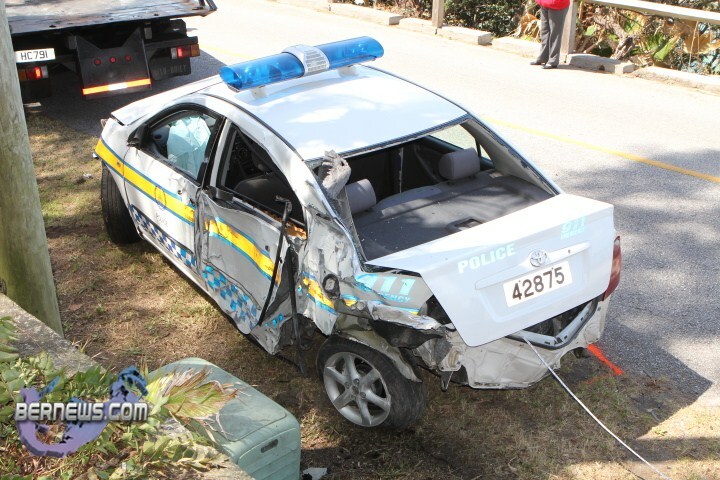 The reason you see accidents involving police cars is because the news mediums available want to take photos of them and plaster them all over the web so people can make inconsiderate comments. They don’t take photos and plaster them all over the place if it isn’t a police car. The news mediums are to blame. So true kiskadee! They do often drive like maniacs! It’s a double standard for sure!